On 11th April 2019, YCE held Energy Café 3 at Quaker Meeting House, which featured a progress update on our Warmer York project and two talks from guest speakers about insulating houses on a national scale and fighting fuel poverty. First up was Russell Smith from RetrofitWorks, who told us about his mission to make it as easy as possible for everyone in the country to retrofit their house to a very high level of insulation in order to reduce their energy bills and fight climate change. The idea of RetrofitWorks is to create a nationwide network of trusted installers (“practitioners”), and facilitate communication between customers and installers via local intermediaries (“advocates”). Russell explained that advocates are an important part of the process because it can be very daunting and time-consuming for customers to speak directly to installers, and there can be misunderstandings caused by communication difficulties. Advocates are members of the community who regularly speak to practitioners on behalf of customers and make sure that the requirements are well understood by all parties, as well as deal with any other issues that might come up along the way. They are also in a position to give impartial advice to customers on the work that needs doing, which is not necessarily a given when talking directly to the people who are getting paid to do the work. Advocates help put trust back into the process, which Russell says is lacking at the moment, and is one of the reasons people don’t commit to getting the work done. 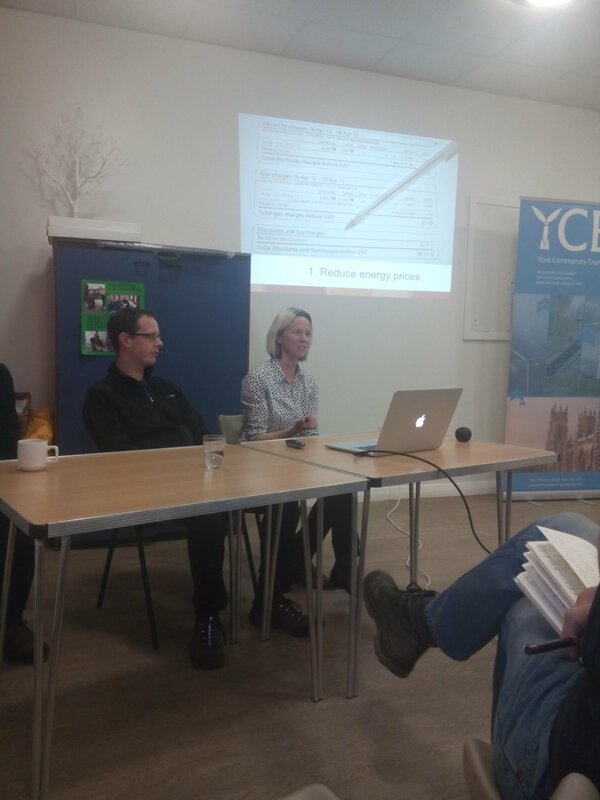 Next, Kate Urwin from Yorkshire Energy Doctor talked about her work with some of the poorest households in North Yorkshire, helping them with their bills and making sure they are able to heat their homes during the cold winter months. Kate can help in various ways depending on the needs of the specific household; this might be by helping them to switch energy suppliers (Kate cited one example of someone who had been with the same supplier for decades and was able to save over £700 a year just by switching!) or by arranging for them to have a new boiler, heating controls, insulation etc. installed, often for free. It was very inspiring to hear how Kate is able to help these people save money, but also slightly disheartening that people are allowed to get into this kind of situation in the first place. It takes kind souls like Kate to identify the people in need (many of whom are referred to her by social services, the fire service etc.) and guide them along the journey to getting help that is readily available for them, but is often difficult to access without expert guidance. Finally, our own Tom de Simone took to the stage to give a progress update on YCE’s own foray into the world of home energy efficiency, known as the Warmer York project. 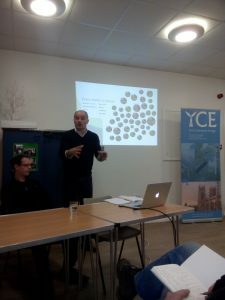 We had teased some details at previous public meetings, but until now we didn’t have much work to show for it. I am happy to report that we have now taken part in a number of home assessments, shadowing Andy Walker of Sure Insulation (who you may remember from a previous energy café) and learning all we can from him. 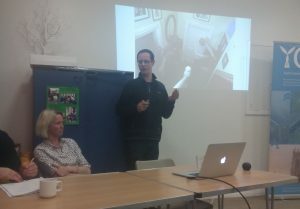 We have also acquired a thermal imaging camera to help with assessments, and Tom has been on a training course with Carbon Co-op in Manchester to learn how and when to use it, and how to set up the best conditions for using it (hint: it involves sucking the air out of the house with a big fan!). We also recently held our first “house warming party”, where YCE members and committee members came together under Andy’s supervision to insulate ex-chair Richard and current chair Ivana’s suspended timber floor! Everyone really got stuck in, and there was even talk of a future party at a member’s house! While we aimed to get the work done in a single day, there was inevitably some overrun, and poor Ivana, Richard and Andy were left to finish off the following day (and the next day…)! Still, Ivana informed us at the Energy Café that there is already a noticeable improvement in the warmth of the room. Good to hear! You can find photos of the floor insulation job at various stages of the process on our new instagram account. Our next objective for Warmer York, apart from doing more assessments and house warming parties, is to start making connections with local installers. YCE is already a member of the RetrofitWorks network, and ultimately we might consider becoming advocates (as explained above). The first step in that process is to find suitable local contractors and build a relationship with them so we can add them to the network and start facilitating some projects! There will be a video of the evening appearing at some point once we have finished editing it, so watch this space! And finally, in case you didn’t catch it on the TV, here’s our very own Ivana talking to That’s York TV about the Energy Café!